On Sale Now! 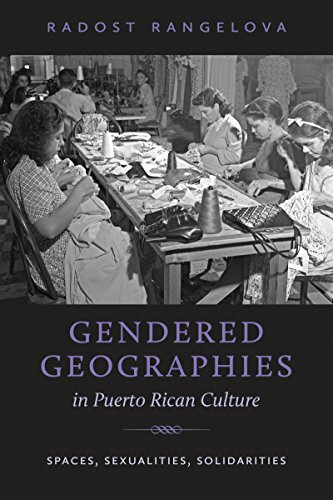 Save 9% on the Gendered Geographies in Puerto Rican Culture: Spaces, Sexualities, Solidarities (North Carolina Studies in the Romance Languages and Literatures) by University of North Carolina at Chapel Hill Department of Romance Studies at Translate This Website. Hurry! Limited time offer. Offer valid only while supplies last. This is a critical study of the construction of gendered spaces through feminine labor and capital in Puerto Rican literature and film (1950-2010). This is a critical study of the construction of gendered spaces through feminine labor and capital in Puerto Rican literature and film (1950-2010). It analyzes gendered geographies and forms of emotional labor, and the possibility that they generate within the material and the symbolic spaces of the family house, the factory, the beauty salon and the brothel. It argues that by challenging traditional images of femininity texts by authors and film directors like Rosario Ferre, Carmen Lugo Filippi, Magali Garcia Ramis, Mayra Santos-Febres, Sonia Fritz and Ana Maria Garcia, among others, contest the official Puerto Rican cultural nationalist discourse on gender and nation, and propose alternatives to its spatial tropes through feminine labor and solidarities. The book's theoretical framework encompasses recent feminist geographers' conceptualizations of the relationship between space and gender, patriarchy, knowledge, labor and the everyday. It engages with the work of Gillian Rose, Rosemary Hennessy, Doreen Massey, Patricia Hill Collins, and Katherine McKittrick, to argue that spaces are instrumental in resisting intersecting oppressions, in subverting traditional national models and in constructing alternative imaginaries. By introducing Caribbean cultural production and Latin American thought to the concerns of feminist and cultural geographers, it recasts their understanding of Puerto Rico as a neo-colonial space that urges a rethinking of gender in relation to the nation.